Heavy-duty laminated card stock and board book formats, make these boldly illustrated full-color big books veritably indestructible. 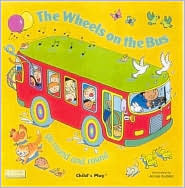 Brilliantly designed with strategically placed holes on each page allowing children to see what’s coming as well as seeing what past making the stories and/or rhymes easier to remember and recite. The Big Books are perfectly designed for story time and when paired Smaller Books as a "companion read-along" they make reading and remembering even easier! If "read-along" suits your Story Time, we recommend adding 5 Smaller Books to each Big Book selection.